The Arran Coastal Way is a fascinating 65 mile/105km coastal walking holiday around one of Scotland’s most famous islands which is often described as Scotland in miniature. The Arran Coastal Way combines coastal paths, forest tracks, roads and stretches of beach to encircle the island. You will walk along beautiful coastal stretches, have the option to climb Goat Fell for a spectacular view of the Island. There are lots to see on the island including the Machrie Moor Stone Circle which are Bronze Age standing stones. You will also get to see some amazing wildlife such wild dear, seals and possibly porpoises. 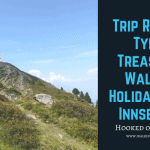 Hooked on Walking offers 2 itineraries for you to choose from. You can chose to do our 7 night tour or our 6 night tour. We have made sure that your overnight stopovers are not in front of you which means you are never seeing the views and walks before you have walked them yourself. We think that this is very important. If you want to explore other islands in this area why not check out our Island Hopping Holiday which is also 7 nights. Arrival into either Glasgow or Glasgow Prestwick airport where you can take the train to Ardrossan. Here you then take the ferry to Arran. Ferries cross several times a day to Arran and the trip lasts around 1 hour. First take the bus to Sannox where todays walk takes you on one of the best sections of the Coastal Way, here you will walk along the rugged coastline from Sannox to Lochranza. Mostly right on the seas edge. Make sure you keep your eyes peeled for dolphins and basking sharks. Lochranza is a remote hamlet of a few houses and a tiny ferry port where you catch the ferry to the mainland. Today you will follow the coastal road for most of the day. Don’t worry though the roads are very quiet and the scenery is amazing. You will start with a hill top route called Posties Path which is between Lochranza and Catacol. You will then pass through the lovely village of Pirnmill before heading towards Imachar on the shoreline, you will then continue further along the route until Machrie. After your walk take the bus back to Lochranza for your second night here. Take the bus from Lochranza to Machrie to begin your walk. You can take a small detour to see the Machrie Moor stone circle before heading towards Lagg. From Blackwaterfoot to Lagg is a fairly tough section of walking however you are rewarded with stunning views. Again some parts of this route will be challenging however as some of the route is impassable at high tide we have taken our route along the optional Arran Coastal Way route which goes along the road for a short distance so that you don’t have to worry about tidal times. At Kildonan you then head inland and onto forestry tracks to Giants Grave and Glenashdale Falls. You will then arrive into Whiting Bay which is one of the larger settlements on the island. It has a good choice of pubs and restaurants for dinner. Today you will go back past Glenashdale Falls before continuing on the path to Lamlash. From Lamlash this final section of the Coastal Way continues round the coast with beautiful views of the Arran Hills and views of Holy Isle. NOTE: 6 night/7 day option does not have the last night in Brodick. You will do your walk from Whiting Bay and then catch the ferry back to the mainland. The Arran Coastal Way is way-marked throughout and is easy to follow with our PHOTO instructions and maps. No official guide book is needed as this official guide was last updated in 2011. Ranges from tarmac road, forestry tracks , beaches and coastal paths. Arran is easily accessible from Glasgow. From Glasgow you catch the train and then ferry to reach Arran within a few hours. Glasgow is served by two international airports. Prestwick airport is the most convenient for Arran and is only a 20 minute taxi journey to the ferry terminal at Ardrossan. Glasgow airport is 8 miles south of the city centre and approximately one hour by taxi to Ardrossan. Ardrossan is one hour south of Glasgow and there is a large secure car park where you can leave your car during your time on Arran. There are regular services from Glasgow Central Station to Ardrossan which connect with the ferry to Arran.